Los Angeles residents and businesses aren’t the only ones who may have overpaid the Department of Water and Power for electricity. The City Council last week approved a total of $6.3 million in settlements with the cities of Burbank, Glendale and Pasadena for overcharges that stretch back to 1998. Those cities’ utilities pay the DWP to transmit power over its vast lines strung across metal towers in the High Desert and elsewhere. When bonds used to build the transmission system were refinanced over the years, the DWP was supposed to lower the transmission rate. But it didn’t consistently reduce the cost, and ratepayers have been paying slightly too much. “If you don’t stay on top of all those little details, you see this gradual creeping up of costs that gets passed on to the customer, and nobody wants to pay more than they have to,” said Pasadena Water and Power General Manager Phyllis Currie. Spread out over future years, the settlements will be credited back to the cities. Pasadena will receive $3.4 million, Burbank will be credited $1.3 million and Glendale $1.7 million. 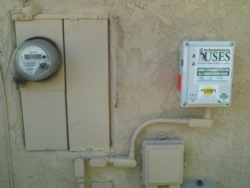 The credits will help offset rising electricity costs for Pasadena customers, who will already see an average of 8.3 percent jump in their bills starting on July 1. But the Pasadena Water and Power budget is so large that DWP credits, and the savings to the average consumer, will be “negligible,” the staff report says. Currie added during the time PWP was being overcharged, the transmission portion of customers’ bills went up slightly but not enough that most would notice it. That wasn’t the case for some Los Angeles residents who saw their bills double last fall after the DWP’s new billing system malfunctioned — a completely separate problem. Glendale was the first city to realize the overpayments, when it reviewed its power contracts in 2010, according to the Pasadena report. That launched contentious negotiations with the cities and the DWP that lasted 2 1/2 years. The DWP board approved the settlements last July. Officials from DWP did not respond to a request for comment Wednesday. On Tuesday, lawyers and city officials from Glendale and Burbank were back at DWP headquarters to protest a new transmission tariff that would increase some rates. The DWP Board of Commissioners approved the new rates, despite the threat of more legal fights.